Coonabarabran is a small town about 500km west to north west of Sydney, Australia. It is the gateway to two major national parks of the state of New South Wales, the Warrumbungles and the Pilliga. It is also the Astronomical Capital of Australia as the nearby Warrumbungles is host to the darkest skies (that are accessible easily) of the country. As a result, Australia's oldest and largest optical telescope is housed inside the national park - The Siding Springs Observatory. The Warrumbungles is an extinct volcano - a volcano that was active 13 million years ago but then, the land around it has withered away in the wind, leaving behind the solidified lava and magma formations. It is a very interesting landscape. Warrumbungle is a Gamilaroi word meaning crooked mountian, and it has been a spiritual place for thousands of years for the original custodians of the land. In the Easter holidays of 2016, we made a trip to this amazing small place. It took us about 6 hours from Sydney to reach Coona, so with the food breaks and rests, we spent almost the whole day on the road. Located deep inside the country, this place is so far away from the glamour and glory of the city that you'll realise, on arrival, that you have travelled back in time. Sunset was beautiful and I did carry my gear with me to capture that moment in time. After sunset, there's nothing much left to do there in the national park but head back to civilisation (or your camp site). There is one other little observatory in the Warrumbungles that you pass by on the way back to Coona from Siding Spring. This is a private one; that belonging to a well known Australian astronomer who goes by the name of Peter Starr. The specialty of this observatory is that Peter hosts tours every night, provided there is participation and an amiable weather for observation. In his tour, the participants get to sit under the night sky and learn about the stars, constellations and galaxies as guided by the astronomer, and then get to see close ups of interesting objects like galaxies, nebulae, planets, etc. in the sky through few of his telescopes. It is one of the most valuable things to do while in the vicinity of Coonabarabran. Siding Spring is Australia's biggest observatory. Some of the greatest astronomic feats have been achieved here. There are a total of 48 telescopes in this observatory but a few have a been damaged by a wild fire (bush fire of January 2013), some not operational because of ageing technology whereas most of them are lying in the observatories idle and waiting for projects to be funded. It is unfortunate that astronomy is not seen as a science that has a direct impact to the country's economy hence, funding for this science has gradually reduced to nothing. Yet, it was the thirst for knowledge of the curious man that has led to the amazing inventions and discoveries that justify this science. Some inventions that were built for use in astronomy have found their way into commercial and consumer use. For example, wi-fi that competes with oxygen these days for the top spot in the important invisible elements for human survival, is invented in Australia by the CSIRO for usage in astronomical sciences, microwaves were invented for use in space, MRI or Magnetic Resonance Imaging was invented for use in the ISS, etc. These were all created by scientists for use in astronomy. There has been a lot of work done for years to contain threats to the observatory through outdoor lighting policy and regional planning. On June 2016, the International Dark Sky Association (IDA) recognised the National Park to be a 'Dark-Sky' Park, and in a way rewarded the hard work that has been done to keep it that way. This recognition is in accordance to the IDA standards that are applicable to other dark sky sites around the world. This is now the only Dark-Sky park in Australia. The closest international dark sky to is at Mt. John Observatory near Lake Tekapo, South Island, New Zealand. There are telescopes in Siding Spring that are still used for research; maintenance of these telescopes is funded by the Australian National University (ANU). Researchers from around the world log in to a website (ironically named 'Skynet') to use the telescopes for their research. Data from the telescopes is available through the web. The first observatory in Australia was created at Mt. Stromlo in Canberra, Australia, but it was completely destroyed by the Canberra bushfire of 2003 - including five very important historically significant telescopes. The ones that were recovered from there were then brought here at Siding Spring and added to the family. Bush fires played a part again in 2013 when Warrumbungle National Park burnt to ashes on Jan the 13th. This time however, preventive bush fire measures, that were practiced earlier, saved the observatory from burning down. All the telescopes remained unharmed by the fire. Few however, were deemed not fit to be in operation after the fire. One of its currently operational telescope is called the Skymapper and its function is to map the sky (you guessed it!). The camera that is attached to its telescope which captures images of the sky has a sensor of 562 megapixels! and is kept at a temperature of -240 degrees centigrade (by helium cooling) to prevent and freeze air before settling on it. This camera creates images of 0.5 TB each, with information that can take 10 years for an astronomer to completely analyse. One image - 10 human years. Solution? - A computer software was thus developed to do the same thing in half an hour. The software (name not revealed in the tour) marks all the known parts of the sky, based on an algorithm fed to it, and flags only those parts of the image that it is unable to detect, and hence could be an anomaly. Astronomers then read that flagged part in detail. Anyway, while they figure interesting things out, I hope you like this image and appreciate the effort of the innumerable scientists, engineers and astronomers who have been feeding the curious mind of man. Astronomy has always fascinated me and made my mind wonder. This image is my representation of how the Orion nebula actually look like, up close, with the visible colours of the human spectrum. What I saw when I took this picture on my camera attached to the 20 inch telescope there at Warrumbungle observatory was a blue nebula. The quality of the image is poor as it has been taken at ISO 1600, and is attached to a telescope with very little bandwidth to correct focal sharpness. 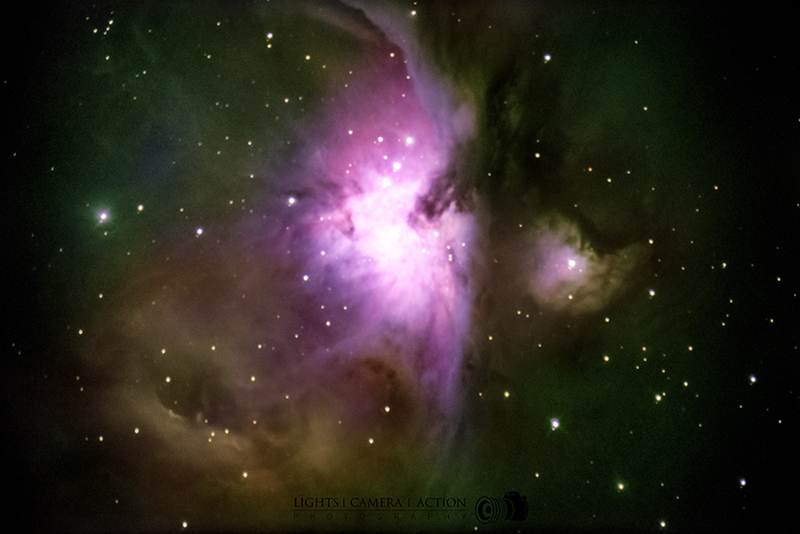 This image was taken two seconds before clouds covered the sky and ruined the rest of the show, making me the only person in the night to own a proper camera shot of the nebula.